The whole thing started in December 2010 when I was taking pictures in the snow after experiencing the shortness and the vulnerability of life. I wondered how wonderful it could be when people all over the world at the same time could be able to share a personal moment and simultaneously enjoying the wonderful magic, beauty and fun of soap bubbles floating in the air? What kind of feeling is then experienced? On May 6 2011 the first International Blowing Bubbles Day took place and all over the world there were to be seen soap bubbles. On May 6 in 2012, 2013, 2014, 2015, 2016 and 2017 the International Blowing Bubbles Day took place again! At many places all over the world and on several grounds there were blown soap bubbles. Magic and fun, grieve and happiness, short term and lasting memories, individual and feeling part of the world community. If a butterfly can influence the world, what could happen when everybody is blowing bubbles at the same time? Join in, be a part of this event and send a description of your activities to us: info@fliplooyen.nl It could be that you are going to blow bubbles in the memory of someone, world peace or maybe for another personal reason. Everyone can join in, on one’s balcony, boat, and garden, in the woods or in the street… Together with others or on your own. Feel welcome, unbound and light. Keep yourself up-to-date by checking the blog and subscribe to stay informed about new postings! 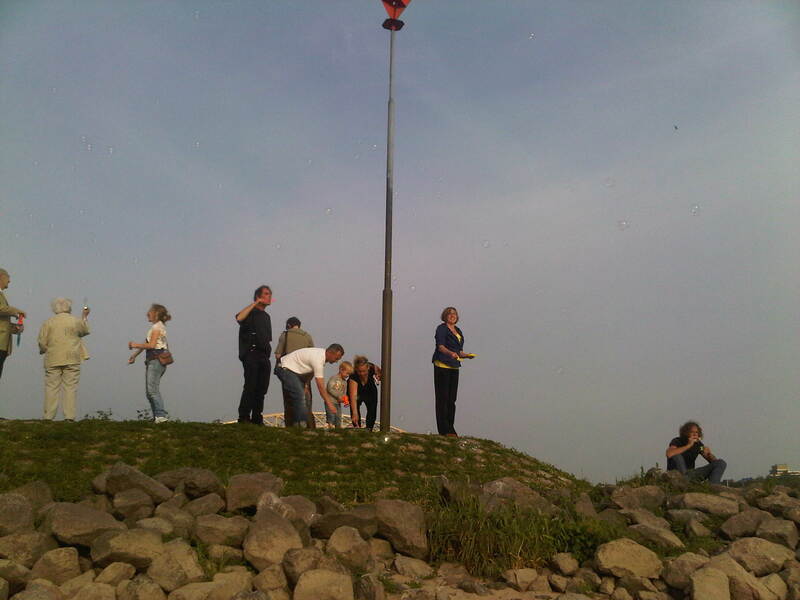 The first starting of the International Blowing Bubbles Day in 2011 and the ending ceremony were both held in Nijmegen. On Rhode Island by PeaceLove Studios were they both celebrated in 2012. The exhibition of the mail art was to be held in the Art of the Heart Gallery in Monrovia, Liberia at the gallery of the famous artist A. Leslie Lumeh.In 2013 the ceremony took place in the neighbourhood of Arhem. In 2014 the ending ceremony was held in Venray in the English Garden (“de Engelse Tuin”), with the participation of M.M.S.K. St Petrus’banden and the poetess Ans van Kessel. The mail art exhibition was held during the ceremony in the Englisch Garden and on Friday May 9th in art galery Satijnvogel in Nijmegen with a first glimpse of what happend on May 6 all around the globe. Sponsord by Dulcop in Italy. It is thrilling to have found enthusiasm for and believing in the project in so much different ways and by so many people. Word spreading and organizing. It is wonderful to experience that a simple idea is growing to an event that makes bounds and friends. Art as an experience, art in a under going way. Thank you all for that! Please visit the presentations on the blog.